I posted a few pictures of my garden which is buried under an abnormally thick, healthy, layer of weeds. Several of you also mentioned that, judging by this photo, you thought some of my weeds may be Lamb’s Quarters. I have had a vague notion in the past that that’s what I had growing. They are one of the thickest weeds in my garden, so I’m used to seeing (and pulling) quite a few. However, I’m sad to say that I never really spent the time to research them. So, at the prompting of a few of my lovely readers, I decided to solve the big question once and for all. I pulled up a couple specimens, brought them in the house, and spent some time looking at photos online. It didn’t take long to figure out that—without doubt— I do indeed have a healthy crop of Lamb’s Quarters growing in my garden! I’ve been anxious to get some revenge on my out-of-control weeds this year, so what better way to do that than to eat them? I quickly announced to my husband that our menu had changed for the night. Instead of steak, pasta, and frozen green beans for supper, we were having steak, pasta, and Lamb’s Quarters. I raced out to the garden while my pasta was boiling and plucked off a colander-full of leaves from the younger, more tender plants. After bringing them inside and giving them a good wash, I plopped them in a few inches of boiling water, and let them cook until they were a little bit limp and a lovely shade of dark green. A sprinkle of salt and pepper, and a pat of butter (because everything is better with butter), they were ready to serve. The consensus? Not bad… Not bad at all! To be honest, we aren’t real big eaters of plain cooked greens at our house anyway (I usually prefer them raw in salads, or mixed in other dishes), but these were very edible. I’m thinking that my lovely crop of Lamb’s Quarters just might replace my spinach in the garden each year. I usually have trouble getting much of a spinach harvest anyway, since the heat always causes it to quickly bolt. Why struggle with spinach when I have a plentiful wild crop that will work just as well? 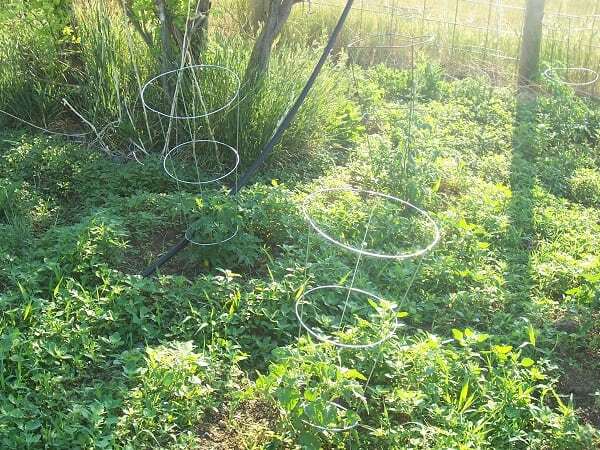 So, just in case any of you out there are also “fighting” a crop of Lamb’s Quarters, here are some tips and recipe ideas to help you turn that annoying weed into a nutritious member of your homestead garden! Before eating any “weed” from your yard, please be very, very certain that you have identified it correctly. Even if that means going the extra mile to double-check with an expert, PLEASE use caution when foraging from your homestead. Many weeds are delicious. Others can be deadly. Be certain that any “weeds” you are consuming have not been sprayed with pesticides. 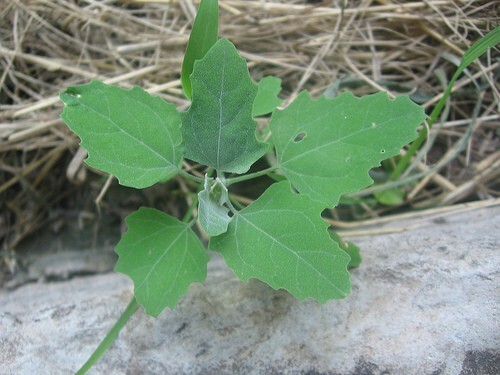 Lamb’s Quarters is also known as pigweed, goosefoot, and wild spinach. The leaves somewhat resemble a webbed foot (hence the name “goosefoot”) and it usually looks like it is covered in a powdery, white coating. During the Great Depression, Lamb’s Quarters was enjoyed and foraged by many families. Lamb’s Quarters is incredibly nutritious. It’s packed full of good stuff- you can find nutritional info HERE. Like many other greens, Lamb’s Quarter contains amounts of oxalic acid. Because oxalic acid can interfere with mineral absorption, there is some debate as to whether people should consume large amounts of raw greens (it’s not an issue once they are cooked or steamed). I personally don’t worry about it too much since I don’t eat large quantities, but if it concerns you, just lightly steam your Lamb’s Quarters before consuming. Choose the stems and leaves from younger plants. They will be the most tender. The seed heads that the plant produces later in the season are edible as well. 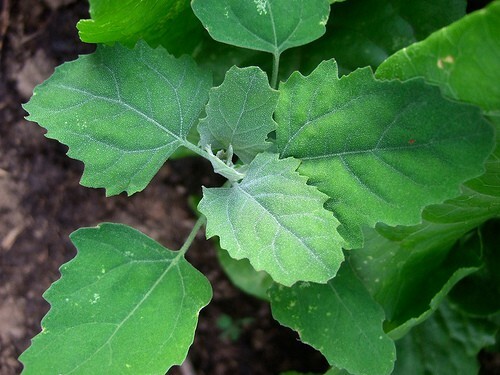 Lamb’s Quarters is related to quinoa, which is clearly visible once you see the seeds. Basically just use it anywhere you would use spinach. It’s an excellent substitute. Lightly steam it and serve with salt, pepper, and butter. Throw some in your stir fry a few minutes before it’s done. Mix a handful or two into your fresh green salad. Use in Italian-style recipes like lasagna or stuffed shells. Mix it with some cheeses (ricotta or parmesan) and use it to fill pasta. Scramble it with your eggs for a nutritious omelet. Make a Lamb’s Quarter spread. Use it on your sandwich instead of lettuce. So, I’ve officially at peace with my Lamb’s Quarter problem. It’s been exciting to learn more about this plant and to realize that this former “pest” is actually a great asset to have on my homestead. Do you have Lamb’s Quarters on your property? How do you use them? What other “weeds” do you forage for? Goosefoot also refers to the vegetable family that includes spinach, beets, and Swiss chard. Our homestead is currently in transition from urban to a rural acreage. I’ve been interested in foraging but because we have dogs, I’ve not felt comfortable eating what we find. Once we move out, the doggies will be fenced in. I’ve started to identify what we have growing and am anxious to make use of it. Transitioning from urban to rural? Bear in mind that toxins in soil can endure for years, even centuries (e.g. the high arsenic level in current rice crops dates back to its use as an insecticide when those lands were used for cotton growing). Have a professional test your land in multiple spots before you consume what grows on it. I guess I’m going to see those weeds in a different light. Wednesday is pasta night so Lamb’s quarters will be in my sauce !!!! Boil like quinoa ? Toast and add to a salad or bread dough? My turn to research !!!! I didn’t find a lot of exact ideas on what to do with the seeds- although I didn’t search too hard on that either (mostly was just after leaf ideas). You’ll have to let me know what you find! We add the seeds to everything cooked, especially to oatmeal, but the seedheads are often dipped in batter and deep fried, then pulled through the teeth to eat. We also add to smoothies. the larger ones can be enjoyed by stripping leaves from tough stems. We also trim plants of their tender tops and they regrow more tender leaves and stems. We love Lambs quarter! I have a section in my raised bed just for Lambs quarter. We have it steamed, stuffed in chicken with cheese, salads, stir fries – so tasty! Stuffed chicken with cheese…. YUM! 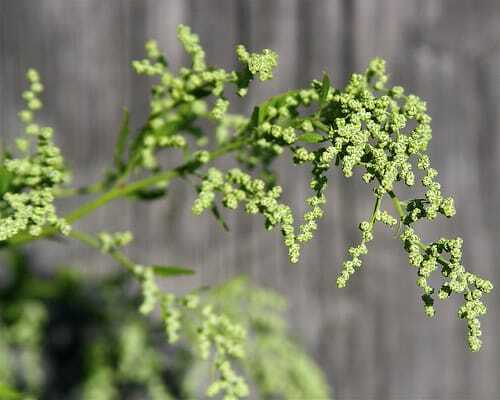 Wind pollinates these small, green, inconspicuous flowers, which grow on slender, branching clusters. Edible, they don’t taste very good. I guess I’ll stick to the leaves…Just picked some !!! Good to know Patti! I think I’ll stick to the leaves for now, too. Thanks so much for sharing the info! For those that are really skeptical, sautee the lambs quarters with garlic, add any combo of cheeses, and make some quesadillas. My 3 year old wouldn’t touch greens on a plate, but stuff it in something with cheese, and he’ll devour it. Ooooh YUM! Brilliant idea- think this may just be our supper tonight if I can get some tortillas made! You could actually use the plant to make the tortillas! 😀 the seeds can be dried, ground, and grinded into flour. Your pasta looks delicious! Can I get the recipe? Well, that particular batch just happen to be an experiment! 😉 It combined my alfredo recipe with another sun-dried tomato & basil pasta recipe. BUT, hope to have it ironed out and on the blog soon! I’m new to foraging too Kristy- But it sure has been fun so far! Yes, I have some purslane, too- it’s next on my research list! My kids eat purslane raw. They pick it, wash it, eat it! Purslane is tasty and nutritious. It’s just starting to emerge in my garden–it likes heat and we’ve had a cold and rainy spring. Purslane is actually a source of Omega 3s. Love it stir fried with garlic. One of my favorite veggies. My kids love it. Don’t know why people think it is a weed! I do love greens and I think if after you butter it lightly you add(to taste)a small amount of your favorite vinegar you will be surprised at what a difference it makes. If you have them you could sub fresh lemon juice but I prefer vinegars. Ooooh vinegar- excellent suggestion Cindy! what a great post! Thanks for all the information. i have been pulling the darn things out too. Now i will add them to my list of “good weeds” in my beds. I also have tons of plantain, purslane, danylions and sorrel. sorrel is very tasty and tart, makes great lemony addition to any salad. I always picked it and ate it as a kid just out in the pastures. Free food from the creator!!! I know- isn’t free food the greatest?! Kelly over at the Morristribe was dehydrating it to use in soups and casseroles! Oh my goodness… I read this early today & eagerly looked in my garden when I got home. I have Lamb’s quarters!! I’m eating them right now in a dinner veggie omlett. Thanks for writing!! Wahoo Ashley! How cool is that?! Thank you once again for posting this. I had a whole different attitude working in my garden this morning. 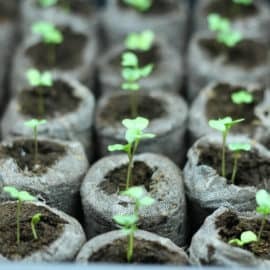 Instead of feeling defeated, I felt energized looking at all my good edible free and easy to grow plants! We used to grow a lot of lamb’s quarters (not on purpose!) as a kid. Where we live now though, they’re much more scarce. Kind of sad really. 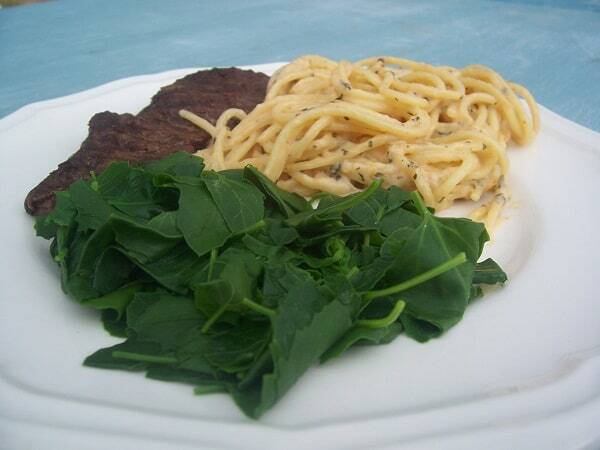 If you are troubled with your spinach bolting you will find Swiss Chard is milder and can better take the heat. But, still eat the weeds! Too funny! I just bought a pack of seeds for lamb’s quarters, I could have just gone out and raided my weedy garden… 🙂 Thanks for sharing! I started ‘cultivating’ some weeds IN by veggie garden, called “Purslane”. They, too, taste like spinach! I put them in my scrambled eggs in the morning, and sometimes I put them, raw, in my salad, along with tender, young (never sprayed w/ weed killer) dandelion greens. Yes! I have purslane, too. I stuck some in my lasagna recipe last year and it was yummy! I wonder if wild plant seed packets can be purchased for planting. Whenever I see edible wild plants, there usually are not enough to make a dish. I have never seen or recognized lamb’s quarters, but I enjoy young, tender pokeweed. It tastes very much like spinach, but better. I love foraging for chickweed (Stellaria media) in late winter/early spring. It’s an abundant “weed” too. It’s yummy as a salad green or lightly cooked like spinach. As a medicinal herb, it’s historically been used to make skin healing salves. Since it likes cool weather, it will often pop back up in the fall again for another crop. We have purslane around, but it’s too close to the road to be safe to eat. As a kid, I would love to eat sorrel, but for some reason I just don’t see much of it where I am. The dandelions where we live don’t put out very good leaves for salad, unfortunately. I remember weeding lamb’s quarters as a kid, now I wish I had them around to eat. I too have a small piece of land just outside town & have SO MANY WEEDS! I am interested finding the best website to identify them. I have access to a camera, so I would be able to take photos if anyone would be interested in helping. I would love to know if I have any edibles ones & so would be able to eat fresh greens AND SAVE MONEY! 🙂 WIN WIN !! Eat the weeds website and Facebook forums are all you need . I heard a Dr speak on oxalic acid foods and mentioned eating rice with them balances it out. My mother grew up in the Carpathian mountain region. Life was very difficult and they learned to utilized weeds. 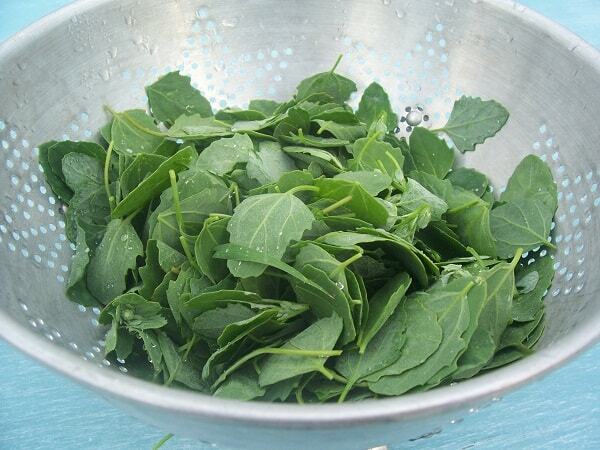 My grandmother would make onions diced and fried and make rue, add milk then add lambs quarters (young tender) leaves. This is the best soup ever!!!! Sounds good Ruth- I wouldn’t have thought to make soup from them! Can’t wait to try some Lamb’s quarters! I have been studying online about them too. I’m new to harvesting wild edibles and so excited about it. Too bad it is dead winter here and hardly a green thing to be seen, but I’m taking lots of notes and eagerly awaiting spring! Love your posts and your blog! I saw one man online who had tons of plantain (why couldn’t you do it with lamb’s quarters?) cutting the larger plants off in big handfuls and drying it on racks for feed for his rabbits in the winter. I suppose if you had some sort of drying racks outside, it wouldn’t be too hard to cut enough for 1 rack a day and rotate them. Free food for the animals too! Oh, I like the drying and feeding it to animals idea! It’s funny- I’ve caught myself wishing I had some lamb’s quarters to pick several times this winter. This is definitely the first time I’ve wished for there to be “weeds”, ha! 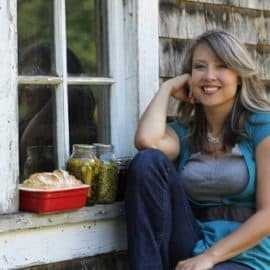 Hi Jill, I see this post is from last summer. I found it doing a search to see how long lamb’s quarters will keep after being picked. 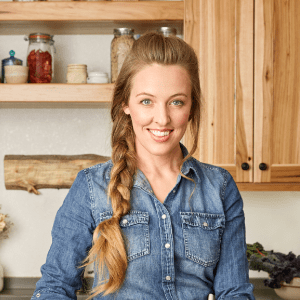 Tomorrow, I am planning to make a recipe for creamed lamb’s quarters and mushrooms I found in Kay Young’s book, Wild Seasons. I haven’t cooked with lamb’s quarters for a long time, but munch on it raw from time to time. I have an assortment of weeds across the street from us, where I carve out spots to grow vegetables. Anyway, I was thinking about picking it today. If you see this in time, please let me know if you’ve done that before. 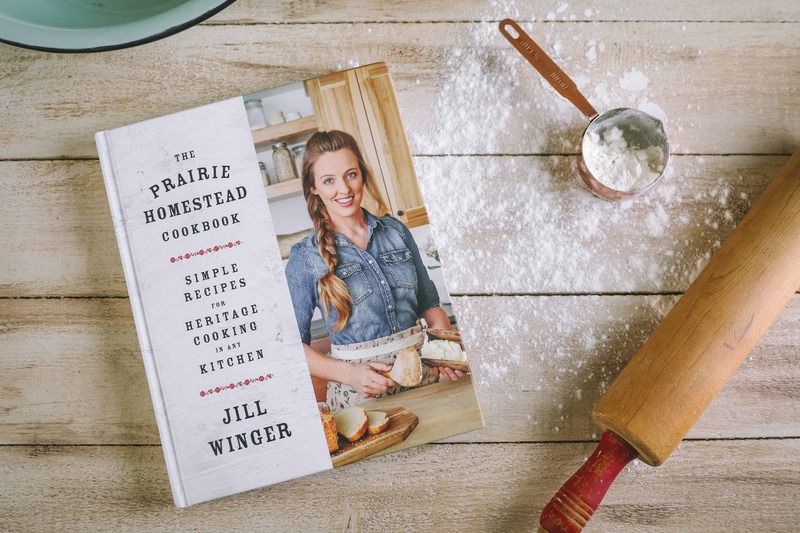 Jill, you have done it again…you are just so clever. So I can now feed my family and my piggies while weeding the garden. Thanks! Everytime I click on your site a TROJAN detection happens….might need to have someone check your website out. Yes, have been trying to figure out what’s going on. My host and I have scanned it over and over, and it’s coming up clean for us, but we are still having a couple folks whose virus programs are going off. I just found an app that helps you identify those weeds! Wild Edibles with Steve Brill (wildman) by WinterRoot LLC. It seems very comprehensive! Oooh… That sounds like a great app! That almost makes me wish I had a SmartPhone again! oops! I want to try jam this year! I’ve made syrup from the berries to help ward off cold season! I have done some foraging for a few years and it needs to be a slow learning process in order for it to be a safe one. You need to know how to find the target plant well several times before picking it the first time. More importantly you need to ask “the internet” if there are any lookalikes that could possibly be harmful or worse and find a few of them first also. Once you figure out how to keep the process safe it is time to proceed with harvest for consumption. Don,t shortcut the process because there there are weeds, berries and fungi that are not pleasant tasting or will make you sick and others that will lead to a fatal experience. In haste I have done the first two and they are not fun at all. For example Socrates accomplished his state required suicide by eating the poisonous hemlock plant . It grows everywhere in my Midwest yard. That plant takes out the nervous system (stops breathing) other less pleasant ones destroy the kidneys and or the liver. Some toxic or poisonous plants have an accumulative effect and others only require the smallest sample to do their deed. 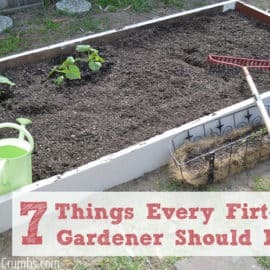 Some common plants like rhubarb have toxic leaves and roots other plants are good only at certain stages of growth and development like pokeweed and cowslips. Proper identification and timing are my two primary precautions. There are lots of good wild harvesting choices to make for weeds, berries and mushroom fungi. Some very good books for me in the midwest are by John Kallas, Samuel Thayer and who could forget Euell Gibbons, I try to buy used or overstocked books actually the library is my first choice to quickly look over these books they can even find a title in another library and for postage cost get it for you on loan. My favorite local fare is purslane, lambs quarters, dandelions, asian day flowers, chickweeds, another pig weed called red amaranth, plantain, the very common quick weed, nettles are very good and useful when young. If the leaves are rolled in a ball and worked over for a 15 seconds they will not sting (me), snipped up in salads or cooked into dishes or dried for tea all work for me. It has more C than oranges. I eat several daily while doing my 1-2 hour dog walking duty. up till they flower I use the top 2-3 leaf pairs selectively after that I hear there is a compound in them not good for some peoples kidneys. Pine needle tea is very nice as are linden leaves. Wild leeks or ramps are wonderful so can garlic mustard be in the spring. The list is extensive. Many Weeds are global and were brought here in the pockets of immigrant pioneers as favorite free foods but may now be widespread cursed weeds. I eat several mushrooms besides the obvious morel. Druids shelf or pleasant backs, oysters from boxelder trees, shaggy mains, puffballs, chicken of the woods and hen of the woods so far are ones I can safely find to eat. Again season timing and poisonous look alines need to be considered. Hope this provides prospective and encouragement to explore all that nature can provide. Rambling on a bit more. Wild Man Steve Brill was mentioned above and I have and frequently use his weeds application on my iPod touch which goes wherever I do, besides several applications it”s camera is invaluable help in foraging and all manners of nature study. On the internet YouTube is so valuable to me in many ways as a study /research resource. Wild Man Brill and GreenDean are good foraging stops, my somewhat more local favorite is MiWilderness as he gives a lot of timely and valuable lessons on self sufficiency relevant to my location. YouTube helps me get informed and sometimes misinformed but always challenged and enlightened on topics from A to Z. Another mainstay research gimmick is to google any topic for pictures or photos of the target topic like purslane,shaggy main, aronia berries, just plug in anything for a lot of pictures of it. Click any picture takes you to the web page that contains it and wala you have discovered a new site providing information, clicking on more of those pictures will soon allow you to fill a new bookmark folder of help. Some of those pictures may be dangerously off target but that keeps you no your toes to evaluate the results. At 75 I truly enjoy the challenges of becoming self informed and more self reliant hope you do too. Wow Larry– You are a wealth of info! 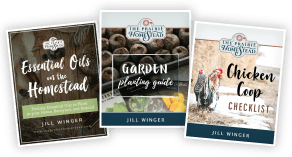 Thanks so much for sharing your tips– learning more about weeds/foraging is something that is definitely on my to-do list for the future. That’s odd. I always heard of “pigweed” as the other term for purslain – which is another edible weed that can be common in gardens. It, too, tastes really good, but it’s very different in look. It grows low to the ground, with red stems and droplet-shaped leaves. Definitely one to look into! Pigs live in many places and eat lots of things so in different places even if only a short distance apart several different weeds became known as pig weed. It was whatever grew and they commonly ate that was given the name. Thru out the growing season the same farmer may have referred to more than one weed as pig weed it was seasonal slang. The plant world is full of renamed, misnamed and duplicate names. Sorry plants.they continue to be regrouped, reclassified and renamed by science. After all no one wants to have their job become extinct. But that concept doesn’t stop at plants. How many Larry’s do you know. One year we didn’t have a garden in our garden plot, so it was overrun with lambs quarter. Since we would be moving in the fall I canned lambs quarter. It cam in handy because we were really short on grocery that year. We had greens for the full year and it helped us to stay healthy. I am wanting to have a big batch this year if possible. They were wonderful. I guess that solves the problem on worldwide hunger. If people would be educated about nutritious weeds, nobody would get hungry again. This one is a fascinating read. I’ve been interested lately in edible weeds and I do get to recognize quite several edible weeds on the side of the road. I just discovered that I had some of this growing in my containers. Don’t ask me how Lamb’s Quarters are growing where I planted zucchini on a 2nd story balcony (in brand new potting soil no less)…but they are! Now I know not to get rid of them. Perhaps a squirrel dug up my zucchini seeds and had a few lamb’s quarter’s seeds on his toes? I feed them to my chickens! In Transylvania and especially in Maramures, we make a kind of filled pancake(placinta cu loboda)with these greens. Make a simple bread dough. Separate into balls–each the size of a small orange. Roll into a 9-inch circle. Fill each with a mixture of chopped fresh greens (1/3), fresh dill (1/3), and chopped scallions (1/3). Salt JUST before bringing together six points of the dough–now with the fillings inside. Roll into a 9-inch circle and fry lightly in oil until golden brown on both sides. After a long winter they are full of vitamins and so tasty in the springtime. I grow it, I prefer it over spinach. It gets high in oxalates when it gets older. Cooking it will break down the oxalates. I had a very similar situation with my garden here in Chicago with relation to an herb I mistook as an invasive weed; acording to my sweet little old Mexican neighbor, they’re verdolagas! Indeed, they’re in the local grocer for $2/bundle and make an amazing pulled pork dish. I don’t want to even try and calculate how much money I was tossing in the compost bin by trying to weed these things. They make a very beneficial companion plant, too! 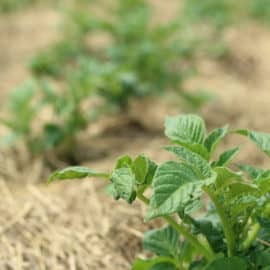 Our soil tends to be compacted dry clay, and luckily enough, verdolagas have tenacious tap roots that break up the soil and pull up water and nutrients for my other plants to make use of, all while providing very low ground cover you won’t have to mow. I highly recommend planting some– if you find them in the produce section, save a root and you’ll have more in no time. Hi! I this is an older article but when I stumbled across it I felt obligated to comment. In 2015 I discovered I could forage lambs quarters for a nutritious addition to my families meals. We loved them. Being pregnant I looked up whether it was safe to consume and found nothing to make me think it wasn’t. So I made lovely salads and it wasn’t until several times later that I realized I would become extremely sick for many hours after and eventually throw up after each time consuming lambs quarters. After I finally realized the pattern, my husband did a broader bit of research online. He discovered that It is called Bathua in India and is grown as a crop where it is more commonly consumed and there it is well-known for it’s abortifacient quality. Also for some unknown reason it makes pregnant women sick and vomit. It not advised for consumption for pregnant women or even those wanting to become pregnant. I can’t even think of ever eating it again after my experience. I hope this info gets to whoever might need it.